Did you know that Louisa May Alcott was addicted to opium? She began using morphine to ease the after-effects of typhoid fever contracted while working as a nurse during the Civil War. The illness was at the time treated with mercury, which caused pain, weakness and hallucinations to the patients. 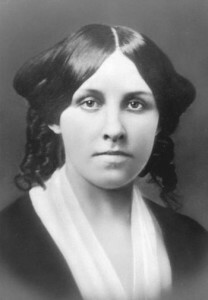 In addition, Louisa May Alcott sometimes suffered from deep depression. In fact, she might even have been bipolar. Her parents supported the abolition of slavery and were part of the Underground Railroad. As a child, Louisa May Alcott was a tomboy running races, climbing trees and leaping fences. Her family was poor, so she started working at the age of 15, often as a domestic servant or as a teacher. Her family moved over 20 times in 30 years. She had a crush on Henry David Thoreau. In fact, Henry David Thoreau, Nathaniel Hawthorne, and Ralph Waldo Emerson were family friends. Louisa May Alcott wrote gothic thrillers under the pen names A.M. Barnard, Aunt Weedy, Flora Fairfield, Oranthy Bluggage, and Minerva Moody. She led the campaign to ban Mark Twain’s Adventures of Huckleberry Finn in Massachusetts. Louisa May Alcott died of intestinal cancer two days after her father on March 6, 1888. She was buried in Concord’s Sleepy Hollow Cemetery, a few plots away from Henry David Thoreau.